The EMW3162 WIFI Shield for Arduino consists of the base board plus the WiFi module EMW3162 (B). It allows you to connect your Arduino/Nucleo board with the Internet or to your home/office network. 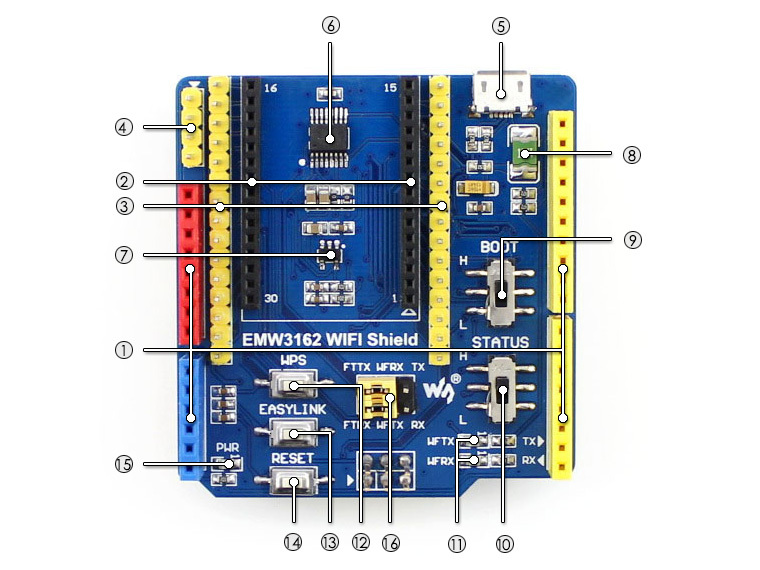 Thanks to the EMW3162 WIFI Shield, WiFi communication will become easy for devices that feature the Arduino connectivity. Is as easy to use as an serial module due to the serial transparent transmission firmware. Comes with ultra low power consumption, online standby 7mA only. Is compatible with the Arduino interface, using only the internal UART. Works as an Arduino WiFi Shield, connects to Arduino boards like : UNO, Leonardo, Nucleo, Xnucleo, etc. Click the button below to add the EMW3162 WiFi Shield For Arduino to your wish list.